My Good School: 3 Step to move a School from good to great! 3 Step to move a School from good to great! At the core of any vibrant society or any institution we need systems to manage, delivery and achieve our goals. No game can be won without strategy and this is the key to success. Today we have tools and good professional help to put in place systems to build a good school. It’s critical to understand the connection between good people and good systems. Good systems support good performance and drive good outcomes. Systems represent best practices which allow good people to excel. Systems provide consistency and predictability, eliminate waste and guesswork, and free people up to perform at their best. Schools must be better managed and the resources optimally used to help deliver 'affordable quality education'. The greatest systems, the greatest technology, the greatest ideas in isolation won’t transform an organisation at all levels. Change creation for building innovative schooling and increasing student learning, is possible only if we manage our schools better. We need to put in place best practices and transform the leadership of the institution. To make this possible we need right people, find the right place and do the right job. To put in place this system we need great training. We must not confuse systems with technology or IT as we often do. System is a good process that makes efficient delivery possible. Yes technology is an enabler and a mere tool, it is not a solution. Training is the key to building the best staff team. With the changing times, we have to continuously align our growth and development to meet the changing needs of the people, the society and the economy. A learning organisation brings to life an ecosystem for intellectual growth and development of the young people. We need to move from competition to collaboration and today the students too have a lot to add in our professional growth and development. The challenge for us is to first connect, then communicate, go on to collaborate and finally create. Knowledge is the epitome of creation, we need to have the best faculty to put in place the most fertile learning environment. To make this happen we have to continuously train and re-train to help deliver the growing aspirations of our people. Teachers today have to be regarded as professionals, like doctors, like lawyers, like managers... they need to keep learning and building up their professional capabilities. 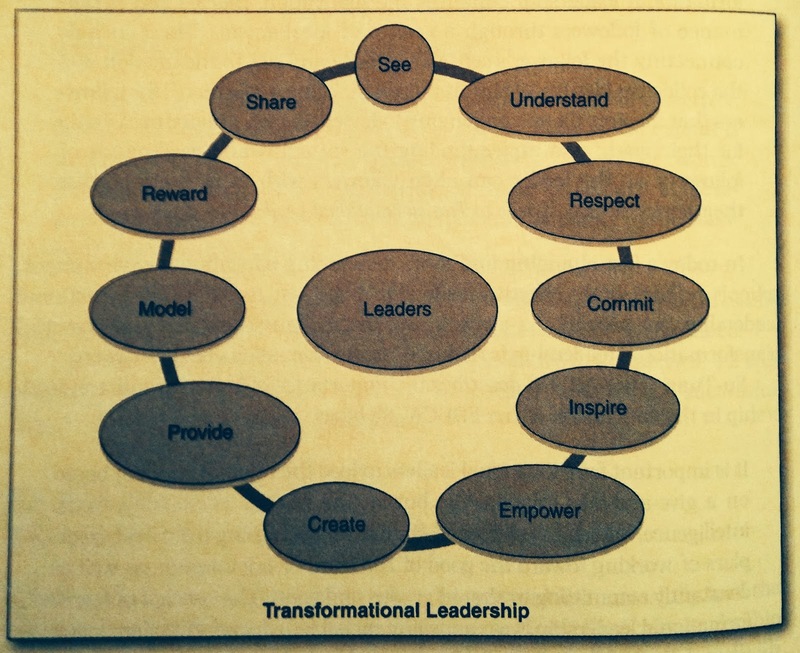 Schools Can Change published by Learning Forward explains the way to build transformational leadership and this is best explained in the graphic below. Training is the only way to help leaders find their strengths and we must work hard to build the leader in every teacher of the school. As stated in Wikipedia, training and development is the field which is concerned with organisational activity aimed at bettering the performance of individuals and groups in organisational settings. It has been known by several names, including human resource development, and learning and development. It encompasses three main activities: training, education, and development. Development: This activity focuses upon the activities that the organisation employing the individual, or that the individual is part of, may partake in the future, and is almost impossible to evaluate. To make education meaningful, it must be inclusive and we need to value each and every individual for his/ her ability and needs. This is only possible if have have a good scholarship programme. Expanding the outreach of a school, is the area of social concern, a scholarship programme to promote the educational interests of the both needy and deserving students and thus helping them in shaping their careers helps make the world a better place. For youth to meaningfully grow and be a part of a harmonious society, we need an egalitarian economic model, we need to equip one and all with quality education. The power of knowledge can not only transform minds but help build sustainable livelihoods. A scholarship is an award of financial aid for a student to further his or her education. Scholarships are awarded based upon various criteria, which usually reflect the values and purposes of the donor or founder of the award. Scholarship money is not required to be repaid. A scholarship is a grant or payment made to support a student's education, awarded on the basis of academic or other achievement, synonymous with grant, award, endowment, payment for a purpose and must become an integral part of a good school. Right from ancient time where wisdom or knowledge was not subject to patients or selfish wealth creation, we have examples of how the haves and have-nots work together in the conquest of knowledge. Education without boundaries is best achieved if we make it available to all without fear and favour. The power of knowledge to help transform lives is well established and is the only path for better livelihood for one and all.